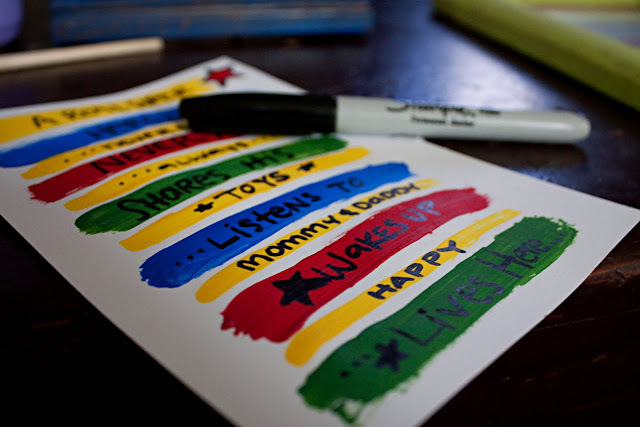 I am really excited that Angie from Treasures for Tots agreed to do this blog swap with me at the last minute. If you are not already a fan, you are about to be super impressed. This woman continually knocks my socks off every Monday, when she links to my party, not to mention all the awesomeness from the rest of the week! You will love Angie as much as I do, I guarantee it. Oh wait, first... I am looking to fill my calendar for more Friendly Friday Features, if you are interested in doing a blog swap-contact me! Now it's all you Angie! Hello to all of y'all at Making the World Cuter! A HUGE thank you to Tiff for this opportunity to introduce y'all to my blog! My name is Angie and my blog is pretty much a place where I create all kinds of different fun stuff for my Darling Little Stinker, Serenity. At 3 years old, she of course knows everything. 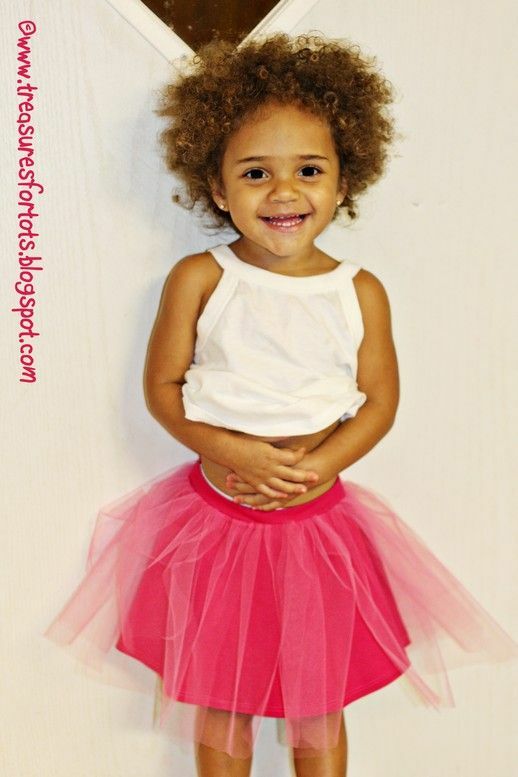 Not only is she a little smarty pants, but she's very funny and totally cute! The brat has got me wrapped around every single one of her tiny little fingers! Most of the stuff I do on my blog is with Serenity in mind. 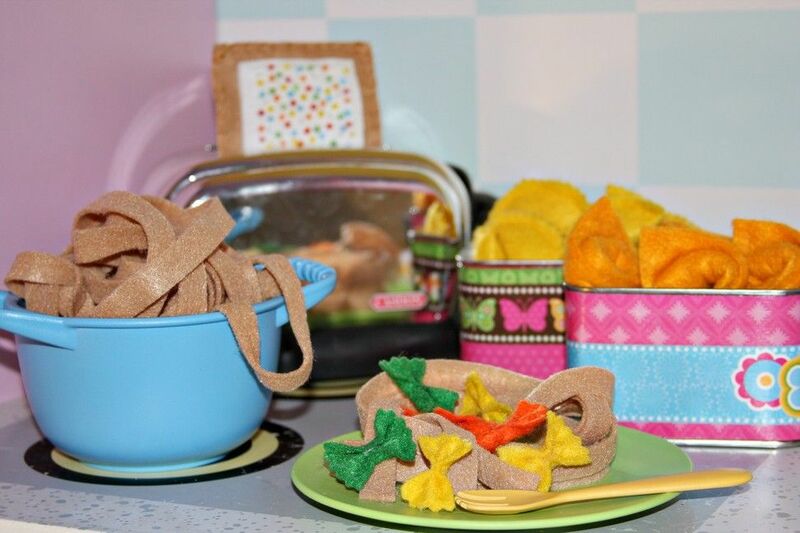 Clothing, felt foods, activities, even food! I told you the girl has got me wrapped! Felt foods are fast becoming an obsession with me. But I want to be able to make it as quick and easy as possible! The sewing kind is beautiful, but who has that much time? 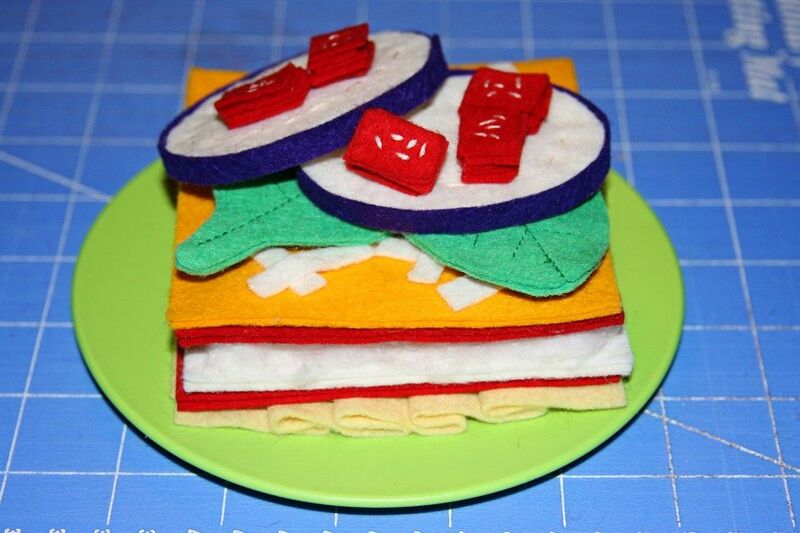 Most of my felt foods involve my totally hot glue gun. But I do a little sewing too! Another one of my hobbies is sewing! I really enjoy sewing - even though I'm kinda slow! I kinda just learned how do any "real" sewing. A little more than 2 years ago I bought my first ebook patterns from YCMT.com. Before that, I basically only knew how to sew a straight line - and yes, it was straight 'cause that's all I could do - over and over! Ebook patterns are so a lot easier than traditional patterns, since they have step-by-step pictures to show you exactly how to sew each step! I've been sewing so much lately that I've gotten a little brave and came up with a couple of easy skirt patterns on my own! Emphasis on the word easy!! Nothing too complicated! 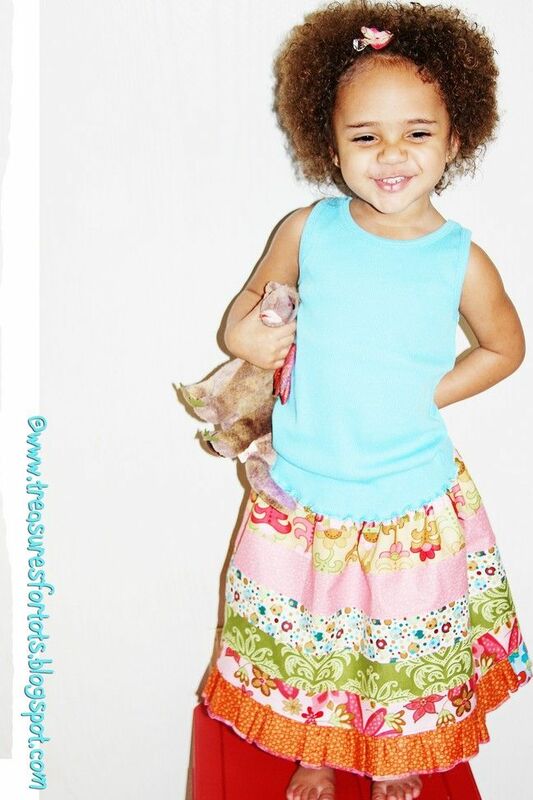 Just click on a picture to check out my Jelly Roll Skirt and my fun Twirly Tee Tutu Skirt! BTW, either one of them would be really cute for Valentine's day too!! I'm trying to get a few Valentine's day Jelly Roll skirts listed in my Treasure for Tots Etsy store by this weekend - but for now, my store is completely bare! I have a few yummy recipes that I share too - maybe something you never tried before?!! 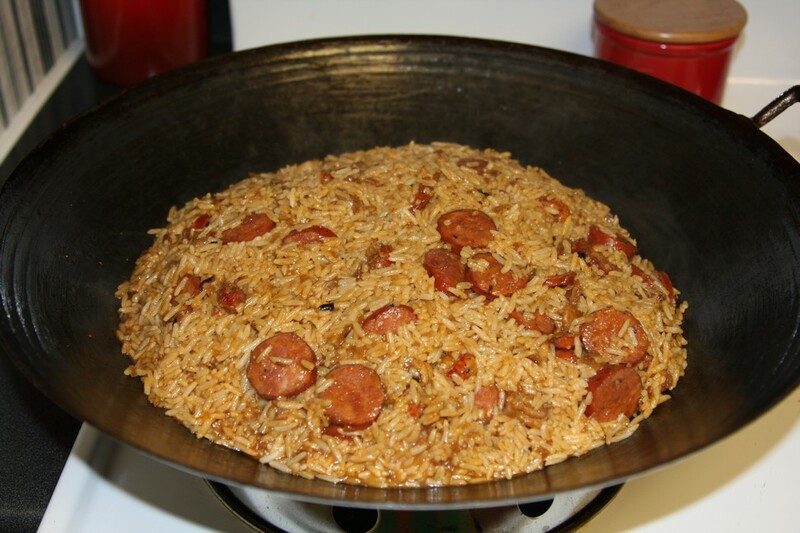 I'm from South Louisiana, so I just had to blog about my delicious Jambalaya recipe - I promise that you'll love it! 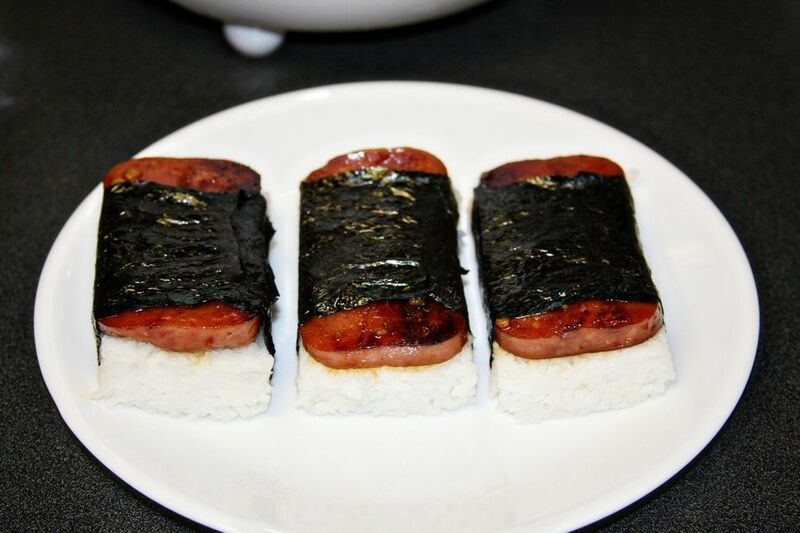 I also show you how I make Spam Musubi! You don't know what that is? Well check it out by clicking on the picture below! I have lots more tutorials on my blog, along with a few more recipes, a crafty party every Thursday called Thursday's Treasures where you can link up anything creative you've been doing, and GIVEAWAYS too! In fact, come check out my blog on Saturday for a brand-new Giveaway to celebrate the Carnival season here in Houma - a delicious King Cake! So don't forget to stop by Treasures for Tots to take a look-see around and maybe show a little love by posting a comment or two too! Thank you Tiff for allowing me to say hello to your awesome readers!! 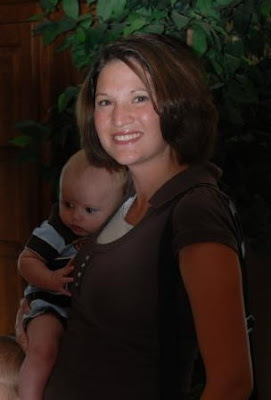 Back when my oldest was just a wee babe, I went to my sister in laws house who homeschooled her kids. 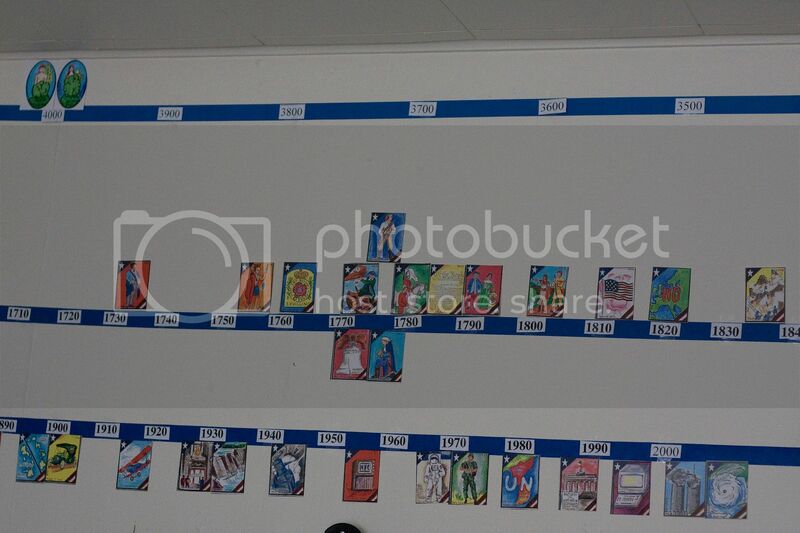 Around her adorable school room was this amazing time line with everything from the Adam & Eve to the present day. 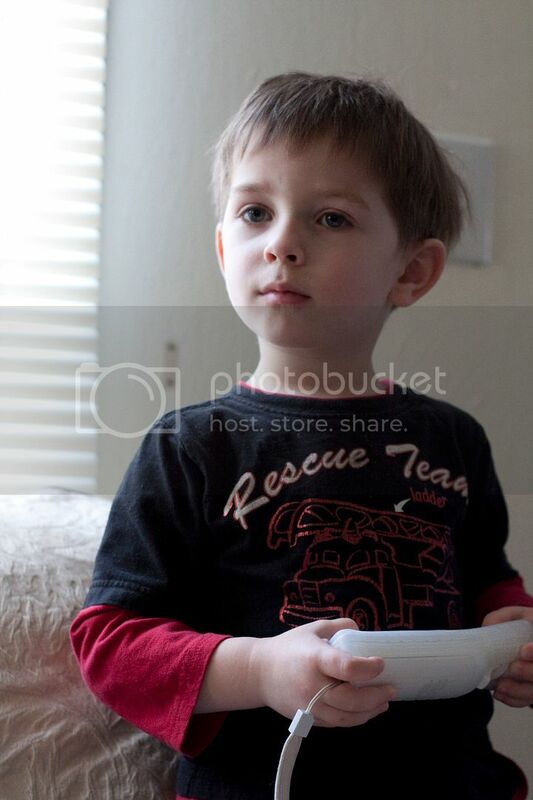 I'm pretty sure the first day I saw that timeline, that was the day I decided I wanted to homeschool my kids. History fascinates me, and to see how everything fits together like that makes me dream of the smell of freshly sharpened pencils and lined paper. Makes me want to learn and teach my kids all of this fascinating history. Well for my birthday, that wonderful sister in law of mine, sent me 3 of those timeline packets. One for the Old Testament, one for the Book of Mormon and one for US History. I've got it hanging around my school room now, and it makes me giddy. The US History one breaks down to every 10 years so I had to put some lower than the big time line, I plan on adding my kids' pictures on this time line as well. If you want some of these here is the website...I just love them! Secondly, Chad and I both got some Amazon gift cards for our birthdays, and we combined them to buy the Super Mario Bros.Wii. It's kick back to Mario 3 which we loved as kids (and still love), but the best part is you can play with 4 players all at the same time. You work as a team, and the controls are simple-my three year old who just doesn't quite get the concept of video games quite yet (unless they are on the computer) has been playing any time we let him, and can actually contribute quite a lot when we play as a team. We are really enjoying this family friendly game. And lastly it snowed here on Sunday, which is amazing, since we have had the warmest winter ever (in fact it's all pretty much melted now) and when the kids got out of the car to go into church it was really coming down, I snapped this picture in the parking lot, and it's now my new favorite picture of them. I'm getting it blown up to put into my living room...it even matches my color scheme! What are some of your new favorite things? I have some fantastic show-offs for you today! I went through all those links, and they were all fantastic, sorry I didn't leave comments on everyone's, but know that I loved them! This kitchen island makeover was done by Mandy at Moody Girl Projects. It's great, but I love what she did to the back of it! 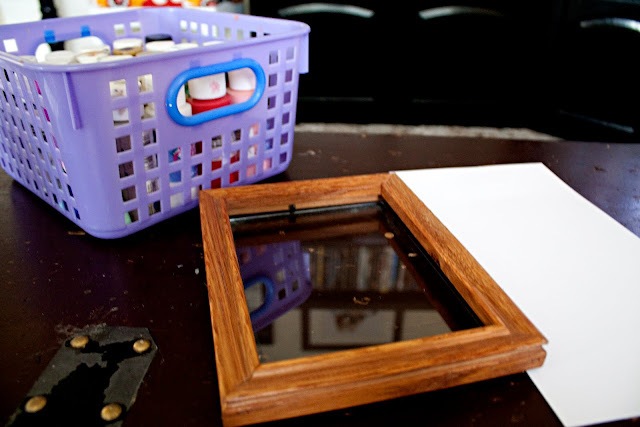 She put a piece of metal on it for a magnet board for her kids, and then she did something that I would not have thought of, but now I want to do a large wall just like it! You'll have to go there to see! Kris from Shabby2Sweet transformed a bland lamp into this masterpiece! Plus she shows a full tutorial on how to do it! Tiffany from On Tulip Trail made this pillow from a placemat-I am absolutely in love with it! Very easy to do, and who'd a thunk? 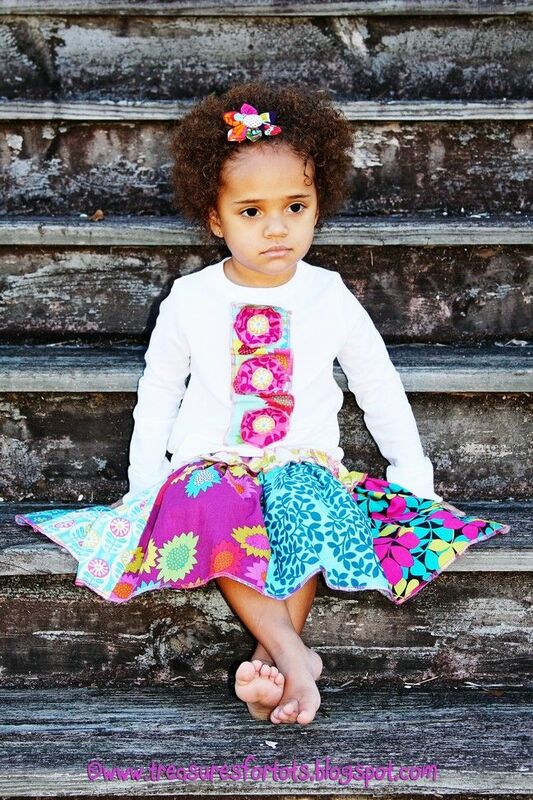 Angie at Treasures for Tots has a tutorial on how to make these adorable long sleeved shirts out of a t-shirt and a pair of socks! How cute is that?!?! 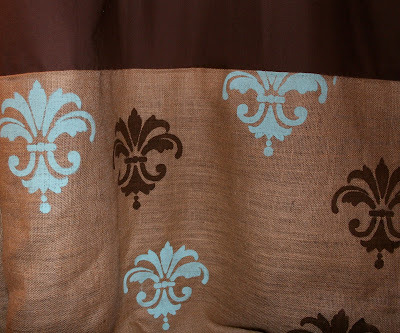 Alyssa at Persnickety Peacock (love that blog name), did some amazing curtains with a burlap trim and some adorable stenciling. You'll have to go there to see the whole result-beautiful! Thanks so much for linking up-can't wait to see what you come up with for next week! Wowzee! We had well over 100 links yesterday, I have barely had the chance to skim the surface of all the fun stuff on that list! Thanks so much for all the inspiration, and of course for making the world cuter! 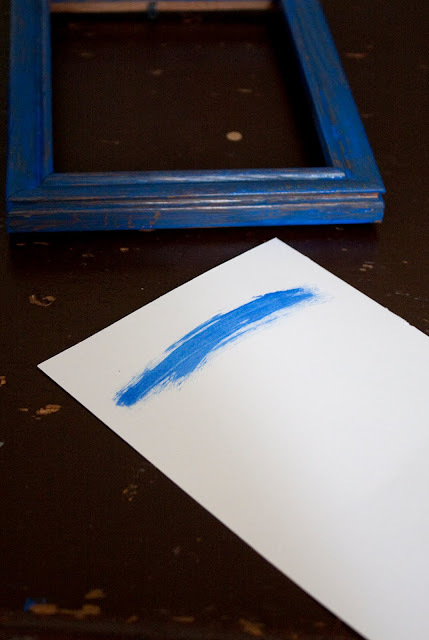 Todays tutorial came out of a need for my kids to have more room to hang their art work, I get at least 4-5 "masterpieces" a day that my kids would be mortified if they saw me throwing them all away. I have file folders for each of them that I save my absolute favorites in, let the kids pick out a couple of their favorites to hang on a board I made for them eons ago, but I have to hang them. They needed something more accessible, and easy to use for them. They also have a small collection of CD-Rom games for their computer that seem to get scattered around in their computer drawer without the cases, and I needed a way to store them better. I went to the good old Home Depot and picked up a 1x2, for less than a dollar, came home and sawed it in half for 2 four foot boards. Then I painted all but the backside black, if I was making these for the kids' rooms I would have put some cute scrapbook paper on the fronts, but since they are hanging in the common hall of the kids loft, I needed something more age and gender neutral...plus I just like black. While I was waiting for the paint to dry, I took some ordinary clothes pins and took them apart like so...just slid the top off... ...and then I have these two pieces. With the bottom of the pin (the side with the spring), I used a little bit of wood glue and secured 1 pin at every 8 inches, for a total of 5. Then using the hubbys power tools drilled holes in them and screwed them into the board with itty bitty little screws. I'm not sure of the size, but I'm sure if you asked someone at the Home Depot for some itty bitty little screws, they could point you in the right direction :). Then with my ratty old sponge brush (seriously need to stop being so cheap and splurge on some more) I painted the whole pin black. And because I couldn't stand the fact that the back of the pin was still wood color I went ahead and painted those as well, even though no one will ever see those. Then using some solid colored scrapbook paper, I mod podged some on the second piece of the clip, painted the sides and back and slid it back into place-distressing the edges a bit with the black paint. Then I hung it up in my kids' hall along with the other higher hanging devices, but this one the kids can reach, and have already filled it with some of their favorites. I think I will make a couple of these up, in some fun colors and prints and give them to my kids' friends for their birthdays with a box of crayons and some paper. It was really easy, and REALLY cheap, and I think could be really cute. For the CD-rom games I took them out of their cases, put them in some protectors and hung them here above the kids' computer, so they can easily see the games, get the games, and put away the games. Love the feeling of getting something like this cleaned up-just feels like a little weight has been lifted off. Hurray for Mondays, I get to sit back and see what you are all doing and feel super inspired! I had a fun weekend, but I didn't get hardly any crafting...or anything else done for that matter. Just a great and relaxing weekend with my kids and hubby. I know you all have stuff to share though! Grab yourself a spiffy little button for your post! After you are done linking here, you might want to link to these parties as well! Hello! I am super excited to be here with you today!! Isn't Tiff just amazing!! Wow, I love all the things that she does. 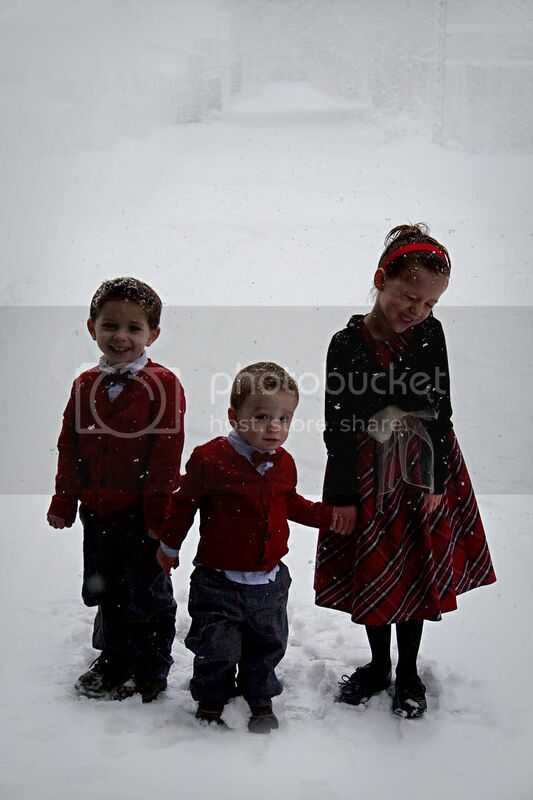 I'm the mother of three adorable little boys, ages 4, 3, and 1. I'm married to an amazing man, he is just wonderful. 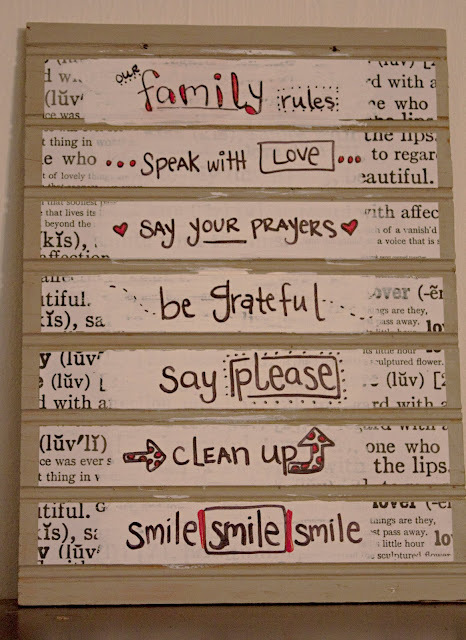 My family is my life! Those boys bring me so much joy and happiness! I am a simple person, I don't like to over do anything. I absolutely love color, especially green, brown and blue. With many hours of painting, I finally don't have a white wall in my house. I'm new to the blogging world but crafts have been a part of my life for a very long time. My crafting started when I was in high school, I wanted something to do with my mom and sisters and it just went downhill from there. I feel in love with creating! You should stop on by!! I have been having several late nights lately! Trying to get anything done during the daylight hours at my house is very unproductive with my youngest always nipping at my heels and hanging on my every limb like a little monkey. 1). I am short on photos this week because I have been editing a couple shoots from the past couple weeks, and haven't taken any snap shots (gasp!). 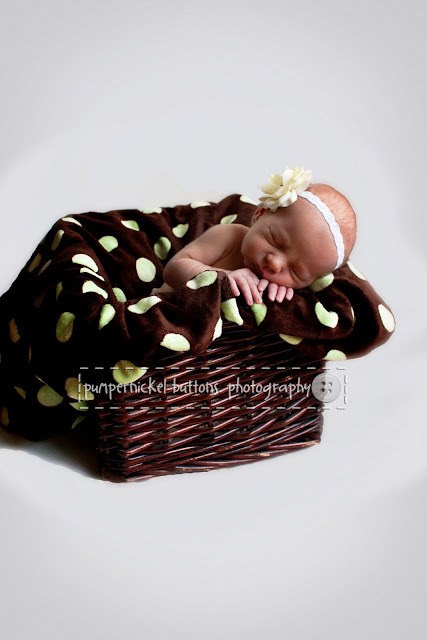 I got this sweet baby's pictures almost done-you can see some more on my photography blog. 2.) I had a FANTASTIC dinner at my friend Suzanne's house last night with a bunch of my nearest and dearest and down right funniest friends to celebrate my birthday. Yes it was a couple weeks late, and it felt a little awkward having people tell me happy birthday when it seems like forever ago, but it was so fun and I got some really fun, crafty and one "clever" (read embarrassing) presents. I love my friends where I live right now, and will be so sad when we end up leaving for Chad's job probably next year. Thank you all for a much needed girls night! 3.) School, school, school! My school, Chad's school, my kids school...if I'm not up working on one of my assignments, I'm thinking about the next day of homeschool or when Chad will be home from school so that we can have some family time. Then with hulu...it's a wonder I get any sleep at all! Luckily for me, my kids are good sleepers, and since we home school we don't have to get up at the crack of dawn. Our school day doesn't start until about 9am, and we can still be in our pj's if we want. Makes the late nights a little more tolerable. What keeps you up lately? You never fail to amaze me! Did you see how LONG the list was this week? I read and I HOPE I commented on every crafty thing on there, I was left with a list of favorites and a bunch of new blogs I am now a proud follower of! Kaysi at Keeping it Simple shows a tutorial on how to make bow ties! MAKE bow ties! And it's easy! My boys are about to have a small large collection of these! Mural Maker & more suggested painting on closet doors, and she shows one of her creations which has a growth chart going up the tree. My kids favorite thing is to measure themselves and I love this lots more than how we just measure up the molding on a kitchen closet! Remodelaholic shows how to make a cheap version of those big baseboards that look so great, it will make you want to rip your baseboards right off your walls and do this! I love what Becca at Blue Cricket Design did with some washers and ribbon, and of course she shows us how to do it, because she rocks like that! How does She makes my kind of sewing project look good! These burp cloths will be my go-to gift for baby showers from now on! I cannot believe that Domestically Speaking MADE this molding and ledge. It is simply stunning! Thanks for all the cuteness yesterday, I can't wait for a quiet hour or so to peruse them today, and find a few of my favorites! 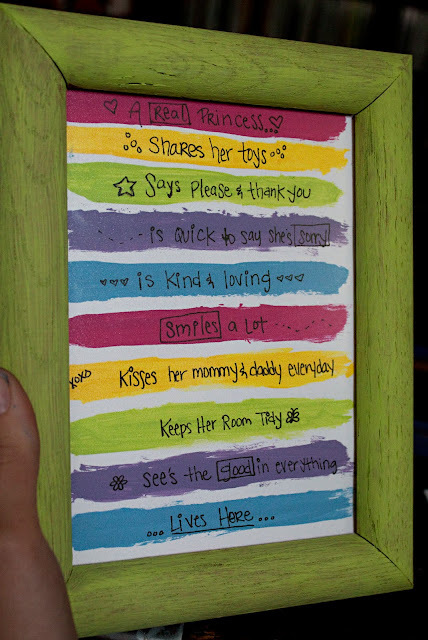 I made this "rules" framed "artwork" for my daughter ages ago, and it has been hanging cutely on her wall ever since. Well my 3 year old is really into super heroes lately, and for some reason has turned into sort of a monster kid the last couple months. He seems to wake up grumpy and hasn't been all that good at sharing or controlling his temper, hopefully it's a phase. So I decided to make him a little reminder for his wall. Then I wrote what real super hero's do on the paint with my trusty Sharpie, (seriously what would my life be without sharpies...I shudder to think!). And voila! 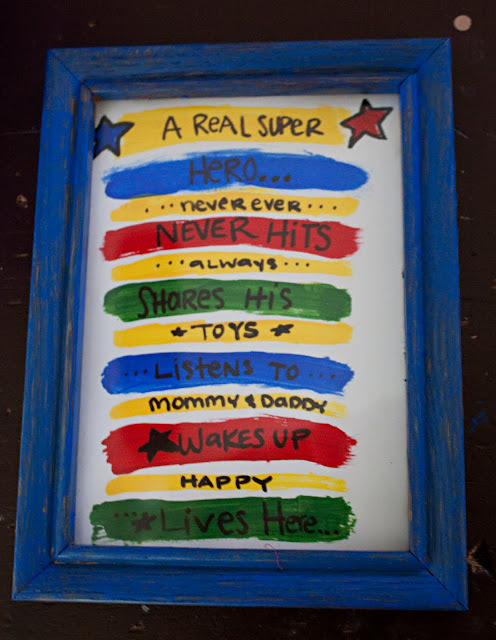 It's already helped improve his attitude, and when he catches himself doing something off of this list, he makes sure to point out that it's because he's a super hero. I had some paneling pieces, so I took one small piece and painted it gray. 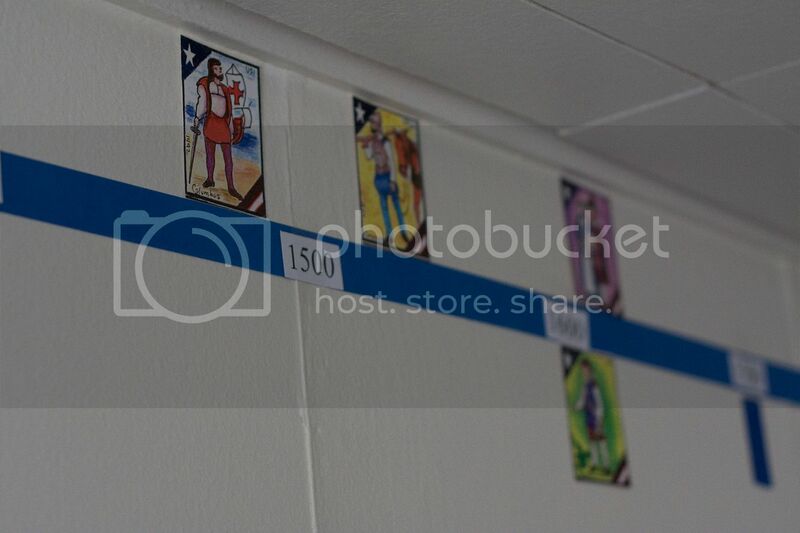 Took some of my go-to 7gypsies paper, and cut it into strips to fit the larger strips on the paneling. I then mod-podged those to the panel. I drilled holes in the top so I can hang it with wire, as soon as I can get to it, it will match my Valentines Decorations so nicely!